Pick: The Memoirs of Henry L. Marsh Book Signing | Books | Style Weekly - Richmond, VA local news, arts, and events. A book signing with Henry Marsh will be held at the Library of Virginia on Tuesday, April 17, starting with a reception at 5:30 p.m.
Henry Marsh began elementary school in Isle of Wight County, 50 miles southeast of Richmond. As a first-grader, he walked 5 miles each way to a poor segregated school, watching the bus to the public white school go by each day. It always seemed wrong to him. By the time he moved to Richmond and began attending Virginia Union University, he decided to try to undo a society where some people thought they could treat others as second-class. He made history and now he is telling his personal story. Marsh has written a revealing book, “The Memoirs of Hon. 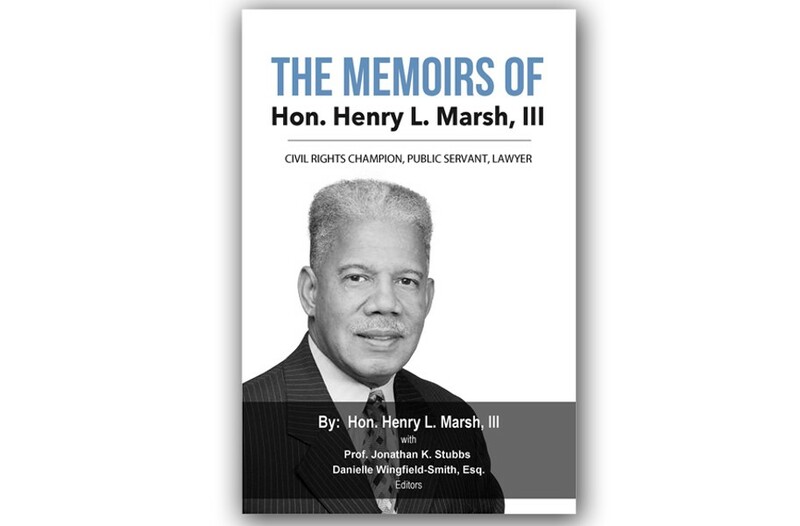 Henry L. Marsh, III, Civil Rights Champion, Public Servant, Lawyer.” It is full of friendly anecdotes from a man who speaks softly. But his stories portray a period when Virginia’s character left much to be desired and the black community was determined not to take it anymore. This book deserves our attention. In Marsh’s early life, nearly a fifth of Virginia’s population still was chained by the everyday practical legacies of slavery: There was no guarantee of equality in the workplace, severe inequity in the public schools, a political system designed to suppress black participation in the basics of American democracy and a social system that denied simple decency to certain people as they went about their daily activities. Along came a succession of black freedom fighters of all kinds, including teachers, preachers, factory workers, students and their parents, farmers, shop owners, funeral directors, restaurateurs, and bankers. In various arenas and in various ways, they disrupted the system of white supremacy. Lawyers were critical to the cause. Henry Marsh achieved local, state and national recognition due to his exceptional skills and because he was driven by conscience to step forward and erase injustice. His “Memoirs” chronicle most of a 60-year career as one of Virginia’s leading civil rights attorneys, growing up in a largely apartheid society but determined to make a broader difference becoming the first black mayor of Richmond, the former capital of the Confederacy, and serving as a local and state elected official for 47 years. Along with his colleague S.W. Tucker, Marsh litigated more than 50 Virginia school desegregation suits, fighting the last vestiges of Massive Resistance. He also tried historic voting and employment discrimination cases, lobbied Congress for Virginia’s inclusion in the Voting Rights Act of 1965 and litigated countless individual cases in which black residents were harmed by callous and unconstitutional discrimination. Marsh was part of a dedicated and close-knit group of black lawyers who, along with civil rights movement leaders, were responsible for the final dismantlement of America’s oppressive segregation laws. Marsh was inspired by his mentor, Oliver W. Hill, Sr., who pioneered litigation to end Virginia’s unequal and segregated schools and brought the lawsuit against Prince Edward County which became part of the 1954 Brown v. Board of Education decision from the U.S. Supreme Court. In 1968, Marsh co-litigated a landmark sequel to Brown, Green v. New Kent County, which decreed that local governments must fully integrate their entire school systems. Marsh was one of the few national civil rights leaders who had a long and successful career in politics. As a member of Richmond’s City Council in the late ’60s and early ’70s, he was one of those who led the efforts of Richmond’s majority black voters to elect their candidates to council and then elect the city’s first black mayor. Marsh was mayor for five years, calmly leading both reform and reconciliation amid much white resistance to black-run government. He served on City Council for 25 years. He then was elected to the Senate of Virginia, serving the 16th District for 22 years. He served as chairman of the Senate Courts of Justice Committee and earned a reputation as a fighter for public education, human rights and responsible gun laws. Marsh, 84, is now retired and lives in downtown Richmond. He and his wife Diane have three children and six grandchildren. He remains in demand as a speaker and he remains a persistent advocate for human rights. Richmonder Ben Ragsdale, a retired community-relations manager and organizer, coordinated the Voices of Freedom oral history project, which is archived online by Virginia Commonwealth University's James Branch Cabell Library. A book signing with Henry Marsh will be held at the Library of Virginia on Tuesday, April 17, starting with a reception at 5:30 p.m. It’s free.